Legend claims in the mid-15th century Heaven sent Emperor Ly Thai To a magical sword, which he used to drive the Chinese from Vietnam. After the war a giant golden turtle grabbed the sword and disappeared into the depths of this lake to restore the sword to its divine owners, inspiring the name Ho Hoan Kiem. Every morning at around 6am local residents practise traditional t’ai chi on the shore. The ramshackle Thap Rua , on an islet near the southern end, is topped with a red star and is often used as an emblem of Hanoi. Founded in 1070 by Emperor Ly Thanh Tong, the Temple of Literature is dedicated to Confucius (Khong Tu). Inside you'll find a pond known as the 'Well of Heavenly Clarity', a low-slung pagoda and statues of Confucius and his disciples. A rare example of well-preserved traditional Vietnamese architecture, the complex honours Vietnam’s finest scholars and men of literary accomplishment. 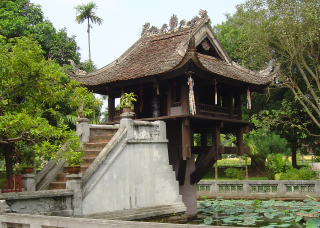 One of the oldest pagodas in Vietnam, Tran Quoc Pagoda is on the eastern shore of Ho Tay, just off Ð Thanh Nien, which divides this lake from Truc Bach Lake. A stela here, dating from 1639, tells the history of this site. The pagoda was rebuilt in the 15th century and again in 1842.